Kasey Chambers has impeccably authentic country music roots. When she was only a few weeks old, her father, guitarist Bill Chambers, and her mother Diane took her and her two-year-old brother Nash to the Nullarbor Plain. It was meant to be a working holiday shooting foxes and rabbits, but the holiday lasted for ten years. Kasey grew up wandering the desert with her nomadic parents. They slept in the open air, or in the back of the family Landcruiser; each night under the stars, Bill would sing country songs to them around the campfire. When the ten year “holiday” came to an end, the Chambers family moved to a fishing village in South Australia so that Bill and Diane could resume their interrupted music careers, and Kasey and Nash could attend school with children their own age. Back in civilisation, with mod cons like radio and TV, Kasey discovered Top 40 music and was soon rocking out to Mötley Crüe and Metallica – but those formative years spent listening to her dad sing songs by Hank Williams and the Carter Family left their mark on her. Bill and Diane began playing in pubs and clubs again and before long they became a group, as first Kasey, and then Nash, joined their parents on stage. They called themselves The Dead Ringer Band, as Nash and Kasey resembled their parents so closely. During her teens, Kasey not only gained experience as a performer, but also began writing songs. Nash built his own studio so that he could produce the band’s albums (he is now a full-time music producer). The Dead Ringer Band put out seven albums, won three ARIAs, two MOs and seven Golden Guitars during the 1990s. After Bill and Diane separated, the band took a long break. When EMI tried to sign them and found the band were no longer together, they were happy to sign Kasey as a solo artist instead. She and Diane took a trip to Africa, and there she wrote many of the songs for her first album, The Captain. The Captain was recorded on Norfolk Island, her mother’s new home, with her dad playing guitar and her brother producing. The album went double platinum, and Kasey went on to win ARIAs for Best Country Album and Best Female Artist. On the back of her success, she toured the US as a support act to Lucinda Williams, and supported Emmylou Harris on her Australian tour. The Captain was a good start to Kasey’s solo career, but her next album, Barricades and Brick Walls, made her a country pop star. Not only did the album go seven times platinum, but her single “Not Pretty Enough” went double platinum. She is the only Australian country artist to have a #1 single and a #1 album in the charts at the same time. She won ARIAs for Album of the Year, Best Country Album and Best Female Artist. In 2005 Kasey married singer-songwriter Shane Nicholson; they met in the early 2000s when Kasey’s brother Nash produced Shane’s critically-acclaimed album It’s a Movie, for which Kasey and Shane performed a duet. In 2007, Kasey and Shane welcomed their first child together, Arlo Ray – he is named after folk musician Arlo Guthrie, and Ray is the name of Shane’s father. Kasey already had a four-year-old son from a previous relationship to actor Cori Hopper, and although Cori may not have been the perfect partner for her, they were compatible enough as baby-namers to both come up with the name Talon for their son independently. Kasey is a fan of songwriter Fred Eaglesmith, and Cori was a supporter of the West Coast Eagles football team, so Talon made sense to both of them. Talon was declared one of the worst celebrity baby names in a Brisbane newspaper, and an elderly woman told her the name was “horrible” – luckily Kasey just found this hilarious. To continue the family tradition, Talon Hopper is already writing his own songs, and has his own band, called The Little Hillbillies, of which Arlo is also a member. Others in the band are Nash’s children Eden, Béla and Skye, and Bill Chamber’s kids from his new relationship, called Tyler and Jake. Rounding it out is Townes Werchon, the son of Kasey’s best friends Worm and Bernadette. 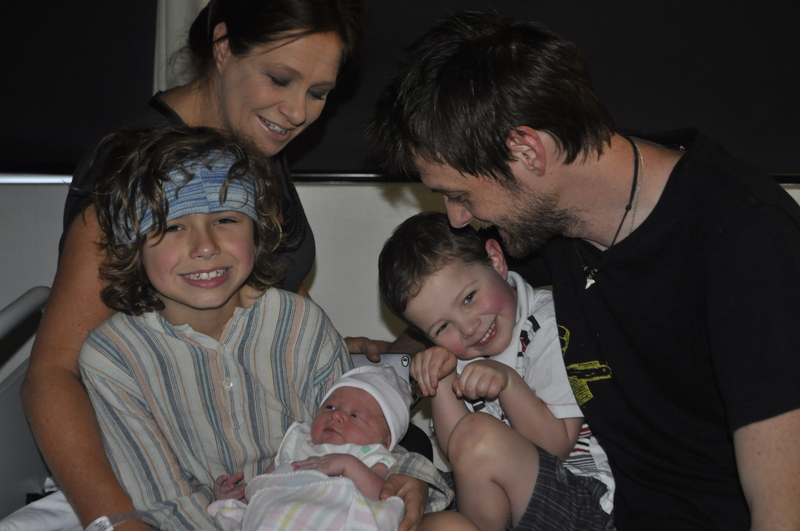 The band has brought out an album called Little Kasey Chambers, Poppa Bill and The Little Hillbillies. Kasey says it is a “politically incorrect” children’s album (I think that means it has songs about poo on it). The album was nominated for the ARIA for Best Children’s Album in 2010, but lost to The Wiggles’ Let’s Eat! I hope that wasn’t about poo, anyway. And now Kasey and Shane have added their baby girl, Poet Poppin, to this big crazy musical extended family. I am just so happy to have Miss Poet Poppin Nicholson as my last celebrity baby name profile for the year, because she is a name-blogger’s dream. She’s exactly what people want from a celebrity baby name – something original, slightly outrageous, fun, fresh and lyrical. Poet because she is the daughter of two songwriters, and Poppin was chosen by her big brothers – because she kept “poppin’ around” in Kasey’s womb before she was born. Add another celebrity trend to the mix: baby names chosen by their siblings. If all the digits on both my hands were thumbs, I still wouldn’t have enough to give as many thumbs up as I’d like. That’s kind of how I see Kasey’s naming style: it’s kind of a mess, but boy, it’s just beautiful. (Photo from Shane Nicholson’s website). Poet Poppin… yep, I like it. I find Poet such a quirky choice, I certainly approve of it! There is something very appealing about Poet. It’s hard to pin down what, but, for me, I wonder whether cute Teletubby Po has something to do with my liking it.